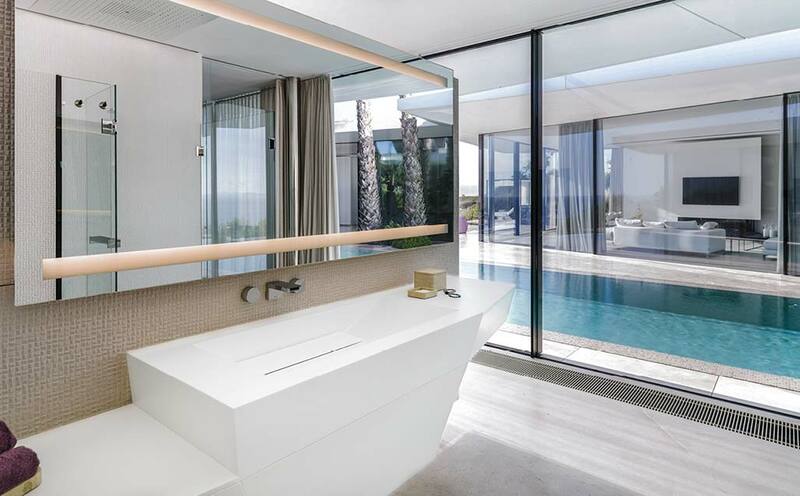 The Jle architecture studio, led by architect Jochen Lendle, was in charge of creating this home with Mediterranean features, located on the Mallorcan coast. For this spectacular construction, it used the solid surface from PORCELANOSA Group, KRION, and the Group’s technical solutions firm, Butech, in charge of installing KRION with its K-FIX construction system. German by birth, Jochen Lendle and his Jle studio have the leitmotiv of “going further”, and this project on the beachfront, 100m above sea level, is a clear example of how to achieve excellence, blending in with its surroundings. We can find KRION in different spaces, all with the common denominator of KRION colour 1100 Snow White. The large perimeter eaves are made from KRION and attached with K-FIX from Butech. The studio’s care for details has led to using KRION in small elements designed for this home such as frames of electrical sockets, toilet flush panels, coat racks, towel racks, and transformations with which we are more familiar such as kitchen countertops and auxiliary units, and bathroom countertops.